A Diagram Exhibiting the difference of time between the places shown and Washington. 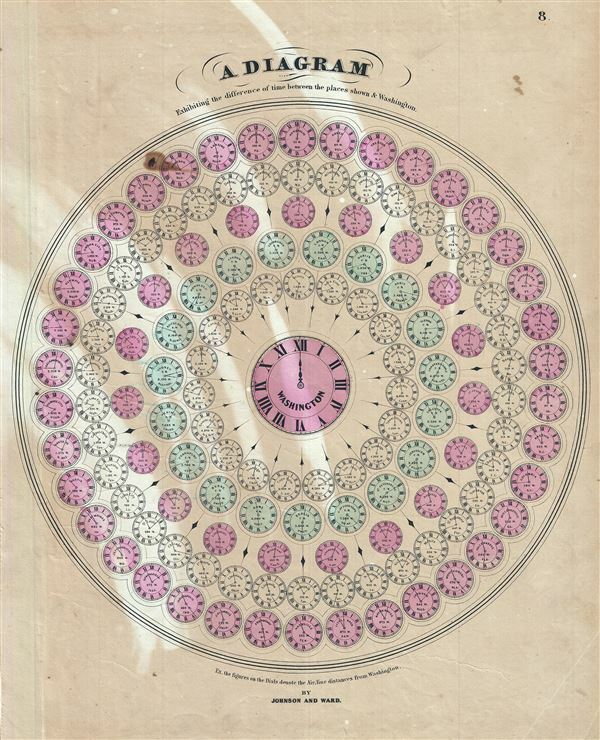 A very attractive example of Johnson and Ward's 1863 diagram of the world's time zones. Consists of a circular engraving in which numerous clocks are drawn, each representing a major world city. At the center is clock representing the time in Washington, D.C. The time in Washington is set at 12 and the remaining clocks are adjusted accordingly, so, if it is 12 in Washington, it is 11:02 in Calcutta and 6:35 in Honolulu, etc. Published by A. J. Johnson and Ward as plate no. 8 in the scarce 1863 edition of Johnson's Family Atlas. This is the second edition of Johnson's atlas to bear the 'Johnson and Ward' imprint. Very good. Overall age toning, with strokes of discoloration. Minor spotting. Blank on verso.